People do overcome challenges. And they do so only when they make and pursue a goal that takes them beyond those challenges. Some people are lucky to be favourably set by their environment and people around them to overcome the challenges on their way to success. They are given opportunities to prove themselves and supported all the way. Maybe they were born by professional musicians and made to learn music at a very young age, and finally become a hugely successful musician. Maybe their parents are both professors and ensured they never lacked any educational resource they wanted; they enjoyed high quality education and, through family connections, got a very high paying job in a big multinational company. Or Maybe their dad is a popular successful politician and had greatly eased their way into politics. In some way and via some people they were given opportunities that made success somewhat guaranteed. But my post today is not about those people. This post today is about the other people, the ones who are not lucky to have people and circumstances around them ease their way to success. The people who are not given any opportunity to succeed. 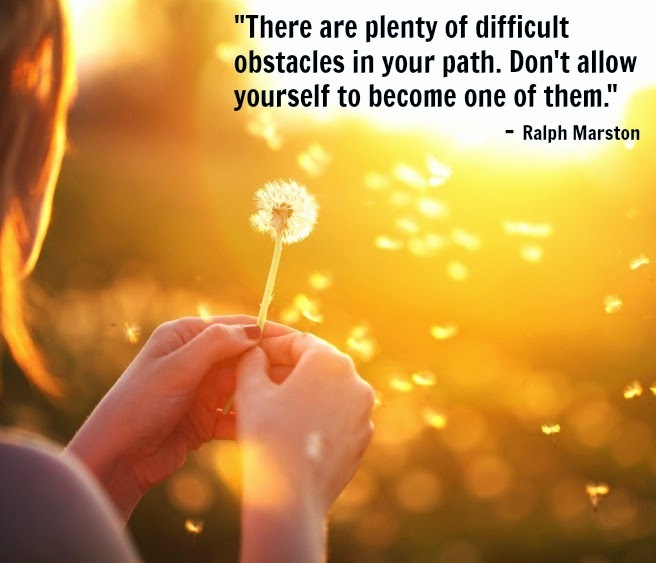 And my message today to them is a quote by Ralph Marston -- "There are plenty of difficult obstacles in your path. Don't allow yourself to become one of them." Don't underestimate your capability to succeed. Don't give up and give in to the challenges you are facing. Don't join the obstacles to your success. You might find achieving success a tougher struggle than other people you know but it doesn't make success impossible. And even history has shown that the most spectacular successes come from people who had to work extremely hard (and with almost no help) for them. That the tougher the struggle, the greater the glory. So when life hands a truckload of challenges with little or no opportunities, don't be discouraged. Still go after your goal, put in the beyond average hard work and aim for a spectacular success.